Yesterday morning, the Ho Chi Minh City People’s Committee launched the “Eternally Remembering Uncle Ho’s Great Deeds” program by planting trees in Xuan Thoi Son commune, Hoc Mon District - one of the many activities occuring across the city aimed at celebrating President Ho Chi Minh’s 118th birthday. The show "Uncle Ho - Immense Love"
Speaking at the launching ceremony, Ms. Nguyen Thi Hong, Vice Chairwoman of HCMC People’s Committee, emphasized that the city Agriculture & Rural Development Department planned to organize this tree-planting festival every year and committed to provide various tree species. The department will also mobilize the public to plant trees during this time, aimed at improving the density of forest to 38.7% till 2010. On the same day, at An Nhon Tay Martyrs’ Cemetery (Cu Chi District), leaders of the local Farmers’ Association and 300 members from 13 districts visited and planted 2 pines and 50 other trees in front of the entrance gate and inside the cemetery. Also, the HCMC Communist Youth Union (CYU) held a partially sum-up meeting in order to review one year carrying out the campaign “Young Vietnamese learn and follow Uncle Ho’s teaching” in the city. In the year, over 98% of union branches organized classes teaching Ho Chi Minh’s thoughts, with over 300,000 members participated. At the Youth Cultural House, hundreds of unionists attended a seminar and festival themed “Youths follow Uncle Ho’s teaching” held by the CYU on the same day. Participants visited the exhibition of photos, books, and documentaries about the President Ho Chi Minh; joined folk games, took part in a contest about Uncle Ho’s life and work, the “Poems dedicated to Uncle Ho” calligraphy competition; and enjoyed the “Uncle Ho – Immense Love “ music performance. In the 2008 English Contest held on May 17 by the Ministry of Industry, competitors told plenty of moving stories about Uncle Ho’s morality in fluent English. 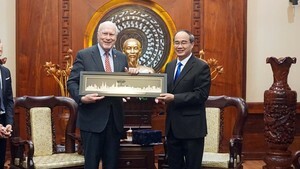 The HCMC Electricity College won first prize. 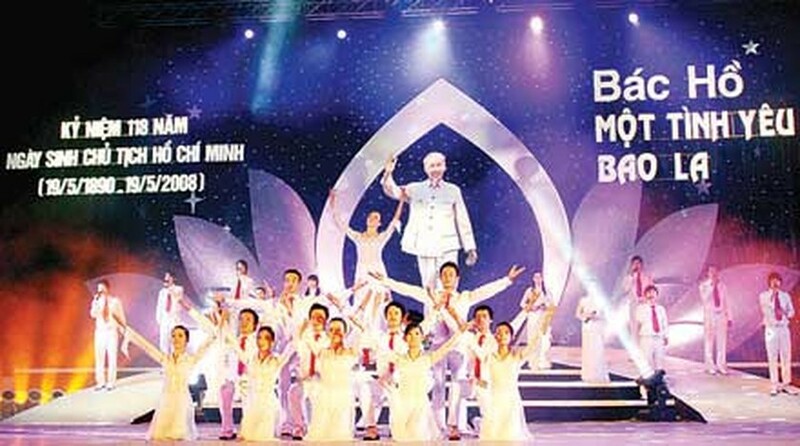 On May 17 evening, the show “Uncle Ho – Immense Love” was organized at Hoa Binh Theatre. The same day, the HCMC Women Cultural House also hosted another musical program titled “Uncle Ho’s Name Shines for Ever”.